Get Your 2017 IDA Calendar! Home » Inspiration » Get Your 2017 IDA Calendar! Less than 100 years ago, everyone could look up and see a spectacular starry night sky. But not today … According to the “World Atlas of Artificial Night Sky Brightness,” 99 percent of U.S. and European citizens now live under light polluted skies. This means that millions of children across the globe will never experience the Milky Way where they live. But it doesn’t have to be this way because you can help us make a difference! This year, we have two ways to thank you for your financial support. 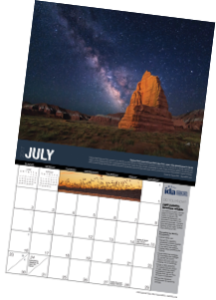 Those who donate $50 or more will receive our stunning International Dark Sky Places wall calendar, featuring award-winning photography of night skies around the world. Those who give a gift of $5,000 or more will be entered in a raffle to win one of two spectacular prints of star trails over Mount Rainier captured by astrophotographer Matthew Dieterich. The image was selected by the U.S. Postal Service as one of its Forever Stamps celebrating the National Park Service Centennial. The 16” x 24” aluminum metal prints are two of only eight artist proofs. Raffle winners will be announced on January 1, 2017. We give a BIG thanks to all the photographers featured in our calendar for generously donating the use of their photos! 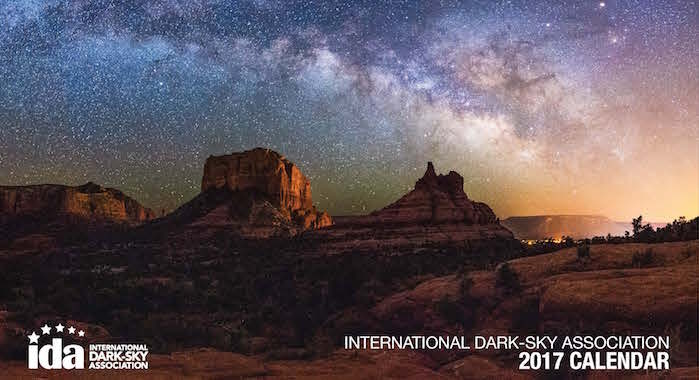 Your generosity supports our International Dark Sky Places Program, which is having another record-breaking year. Thus far, we’ve certified more than 70 Dark Sky Places in 15 countries, protecting over 20,000 square miles of night skies. Your support allows us to provide consumers with state-of-the-art technical information so they can make smart purchases for installing dark-sky friendly lighting. 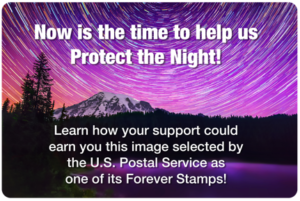 Your gift allows us to work with municipalities, communities, and concerned citizens to stop poor lighting choices that harm human health, wildlife, and the environment. Your contribution helps to protect endangered sea turtles by supporting IDA’s collaboration with the State of Florida to install dark sky friendly lighting on beaches that are critical sea turtle nesting sites.